About 400-450 species in montane regions of the Northern Hemispere, also in tropical Asia and in some regions of South America. There are 80 species in the FSU mainly in the Caucasus (about 25 species), Central Asia, Siberia, the Far East and also in the European part of the FSU. Some have become well-known garden plants, some are prospects for the future. Caucasus (Transcaucasus, western and eastern regions) and Anatolia. 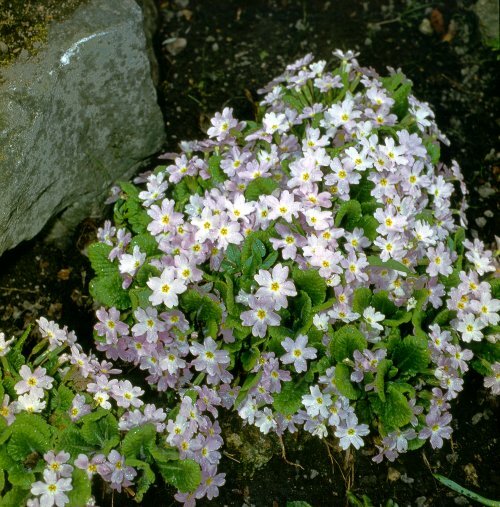 In alpine meadows, humid spots, often near melting snow, 2,000-4,000 m.
Shortly rhizomatous rosette plant, 20-50 cm. Leaves oblong-lanceolate. Flowers bright-purple or violet, rarely blue with yellow eye. Umbel many flowered. V - new growth starts early spring, next generation of leaves mid-summer, in St. Petersburg April-July. Fl - May. Fr - June. Requires a sunny site, but does well in partial shade. Introduced by St. Petersburg Botanical Garden. Z 5 (4). New. Central Asia (Pamiro Alay). In river valleys, on slopes. Rhizome short, with tuft of brownish roots. Scape 15-20 cm. Leaves in rosette, oblong-ovate, 5-8 cm x 1-2 cm, with long petiole. Flowers violet, numerous, in umbel-like inflorescence. V - evergreen, new leaves mid spring to mid summer. Fl - March- May for one month (in the wild). Fr - June- July. P - by seed and division. Tolerates partial shade. For the rock garden and spring decoration. Z 5. New. Caucasus (Greater Caucasus, Dagestan, eastern Transcaucasus). In subalpine meadows, in birch forests. Shortly rhizomatous plants. Leaves oval-oblong, cordate at the base, with winged petiole. Scape long (twice as long as leaves), 30-40 cm. Umbel many-flowered. Calyx cylindrical, corolla 25-35 mm wide, limb flat, lemon yellow. V - early spring to late autumn. Fl - April-May for 3-4 weeks. Fr (if any)- June. P - by seed and division. Does well in partial shade. Well suited to the rock garden. Z 5 (4). New. Siberia (southern region), Central Asia (Dzungarskiy Alatau, Tarbagatay) and Mongolia. Clearings in mountane forests, in meadows, on rocky slopes. Shortly rhizomatous plant. Flowering shoots 20-30 cm. Evergreen lobate leaves in rosette, 15-20 cm long. Inflorescence umbellate. Flowers funnel-shaped, pink. V - new generation of leaves appears mid spring (St. Petersburg May), the next mid summer (July). Fl - May-June. Fr - June-July. P - by seed and division. Prefers sunny locations, however does well in partial shade. Requires humidity and moist soil. Well suited to the rock garden and the flower bed. Z 4. Central Asia (Pamiro Alay). On grassy slopes. Rhizome short. Scape 8-10 cm when flowering, 15-25 cm fruiting. Leaves in rosette, 4-6 x 8-10 cm, oblong-obovate, with short petiole, or sessile. Flowers 5-7, large, purple-lilac, in in umbel-like inflorescnce. V - early spring to mid autumn. Fl - mid spring (May in St. Petersburg). Fr - July. P - by seed and division. Very well suited to the rock garden, and for spring decoration. Z 4. New. Caucasus and northern Iran. In mountain forests. Shortly rhizomatous rosette plant. Flowering stem 10-15 (20) cm. Leaves ovate-elongate with narrow winged petiole, pubescent beneath. Flowers solitary, shortly pedunculate, variable in colour: yellow, white, pink or lilac. V - early spring to mid autumn, in St. Petersburg April-September. Fl - May-June for 3-5 weeks. Fr - July-August. P - by seed and division. Prefers sunny locations but shade tolerant. Does well on any type of soil. Well suited to the rock garden and flower bed. Z 4. New. Caucasus (Greater Caucasus, Kachetia, Dagestan, eastern Transcaucasus). On moist rocks in montane forests. Mat-forming shortly rhizomatous evergreen plant. Leaves rounded ovate, 5-15 (25) cm, glabrous, long-petiolate. Scape 5-10 cm. Flowers solitary, large, pink-lilac. V - early spring, the second generation of leaves mid-summer. Fl - May for 3-5 weeks. Fr -July. Well suited to the rock garden. Z 4. Caucasus (northern coastal area along Black Sea). Mostly in forests, in clearings and among shrubs. Plant with short rhizome. Leaves broadly lanceolate or obovate, shortly petiolate, slightly pubescent below mostly along veins. Scape 10-15 cm. Flowers solitary, large, up to 4 cm diam., white yellow, with fragrance. V - mid spring (April in St. Petersburg), the second generation of leaves mid-summer, some overwinter. Fl - April-May for 3-5 weeks. In southern regions (Tbilisi) Fl - March-April for 4-5 weeks. Fr - May-June. P - by seed and division. Grow in a sunny place or in partial shade. Well suited to the rock garden. Z 4. New. There are other species closely related to P. komarovii with different flower’s color. P. abchasica Sosn. Occurs in the western Caucasus, flowers purple; P. leskeniensis Koss et Smoljian. occurs in the northern Caucasus, flowers white or pink; P. sibthorpii Hoffmgg. occurs in the Transcaucasus, Balkan Peninsula and Anatolia, have numerous dark purple or lilac flowers in early spring (February); and P. woronowii Losinsk. occurs in the western Caucasus, flowers pink. These species increase the number of their flowers when cultivated on a good soil. One specimen of P. sibthorpii can develop 150 flowers (plant with lilac flowers). The flowering period is longer in cultivation, almost two months, the second flowering in September. All these species can also be used as pot plants. Flowering period indoor is about three months. Z 5 (4). New. Central Asia (Pamiro Alay), Afghanistan and northern India. In alpine meadows, in moist places. Plant 10-15 cm. Leaves narrowly lanceolate 5-10 cm x 1-2 cm, tapering to a short petiole, non-pubescent or white-farinose. Scapes 10-15 (25) cm. Flowers large, pink, in globose umbels. Leaves persist throughout the year. Fl - June. Fr - July. P - by seed or rhizome division. Requires a sunny site or a semi shaded position, moist soil, but not stagnant water. Well suited to the rock garden. Z 5 (4). New. Caucasus (Greater Caucasus, Ossetia). In montane meadows with gravelly soil. Plant 10 cm. Rhizome short. Leaves thin, obovate, spathulate, slightly crenate, white-farinose. Flowering scape longer than leaves, umbel many (15-20) flowered. Flowers violet, 15-20 mm wide. V - early spring to late autumn. Fl - May-June. Fr - July. P - by seed and division. Does well in full sun and in partial shade, requires protection from excessive winter moisture. Well suited to the rock garden. Z 5 (4). New. Central Asia (Tien Shan, Pamiro Alay, excluding Zeravshanskiy, Gissarskiy, Turkestanskiy Ranges). In alpine and subalpine meadows, on rocky places, along stream. Rhizome short. Scape stout 15-20 cm when flowering and 30 cm when fruiting. Leaves in rosette obovate-spatulate, 3-4 cm long. Umbel many-flowered. Violet-pink flowers 2-2.5 cm across. V - early spring , leaves usually overwinter. F - mid spring. Fr - in early summer. Z 5. Siberia (Dauria), Far East (southern regions), northern China, Korea and Japan. In meadows, among shrubs. Rhizome short with whittish roots. Scape 15-25 cm. Leaves in rosette, 5-8 x 3-4 cm, ovate or oblong, cordate at base, shallowly lobed, with long petiole. Flowers 3-12, bright purple, large (2 cm diam.) in umbel-like inflorescence. V - early spring to late autumn. Fl - mid spring (May in St. Petersburg) for one month. Fr - July. P - by seed and division. Good for flower beds and the rock garden. Does well in full sun and in partial shade. Z 4. New. Caucasus (Greater Caucasus). On rocky slopes at 1,500-2,000 m.
Plant 10 cm. All leaves in a rosette, long-petiolate, 5 cm long, pubescent beneath. Flower scape stout, as long as leaves, flowers 20-25 mm wide, blue-violet or blue-pink, 2-4 in each umbel. V - early spring to mid autumn, in St. Petersburg April-September. Fl - mid-spring (May in St. Petersburg). Fr - June-July. P - by seed and division. Requires a semi-shaded site. Z 5 (4). New. Central Asia (Dzungaro-Tarbagatay, Tien Shan, Pamiro Alay). In alpine meadows near snow. Plant with short rhizome. Leaves in a basal rosette, simple, 4-20 cm x 2-6 cm, lanceolate or oblong-lanceolate, white-farinose, margin almost entire or finely toothed. Scapes 9-20 (35) cm, numerous. Flowers crowded in globose umbel 6-7 cm diam. Each flower 2 cm diam., corolla purple-violet, calyx dark violet. P - by seed and by rhizome division. Requires a sunny place and well-drained soil. Very well suited to the rock garden. Z 5 (4). New. There are some species that cannot be grown in a hot dry climate. Most of them occur in alpine and subalpine zones, and require moist air and a semi shaded position. Example given, P. algida, P.